Picture - Croatian Air Force MiG-21bis D soaring above the clouds. The Mikoyan-Gurevich MiG-21 (NATO reporting name "Fishbed") is a supersonic jet fighter aircraft, designed by the Mikoyan-Gurevich Design Bureau in the Soviet Union. It was popularly nicknamed "balalaika", from the aircraft's planform-view resemblance to the Russian stringed musical instrument or ołx�wek (English: pencil) by Polish pilots due to the shape of its fuselage. Early versions are considered second-generation jet fighters, while later versions are considered to be third-generation jet fighters. Some 50 countries over four continents have flown the MiG-21, and it still serves many nations a half-century after its maiden flight. The fighter made aviation records. At least by name, it is the most-produced supersonic jet aircraft in aviation history and the most-produced combat aircraft since the Korean War, and it had the longest production run of a combat aircraft (1959 to 1985 over all variants). Development of what would become the MiG-21 began in the early 1950s, when Mikoyan OKB finished a preliminary design study for a prototype designated Ye-1 in 1954. This project was very quickly reworked when it was determined that the planned engine was underpowered; the redesign led to the second prototype, the Ye-2. Both these and other early prototypes featured swept wings-the first prototype with delta wings as found on production variants was the Ye-4. The Ye-4 made its maiden flight on 16 June 1955 and made its first public appearance during the Soviet Aviation Day display at Moscow's Tushino Airport in July 1956. The MiG-21 was the first successful Soviet aircraft combining fighter and interceptor characteristics in a single aircraft. It was a lightweight fighter, achieving Mach 2 with a relatively low-powered afterburning turbojet, and is thus comparable to the American F-104 Starfighter and F-5 Freedom Fighter and the French Dassault Mirage III. Its basic layout was used for numerous other Soviet designs; delta-winged aircraft included Su-9 interceptor and the fast E-150 prototype from MiG bureau while the mass-produced successful front fighter Su-7 and Mikoyan`s I-75 experimental interceptor combined a similar fuselage shape with swept-back wings. However, the characteristic layout with the shock cone and front air intake did not see widespread use outside the USSR and finally proved to have limited development potential, mainly because of the very small space available for the radar. Like many aircraft designed as interceptors, the MiG-21 had a short range. This was not helped by a design defect where the center of gravity shifted rearwards once two-thirds of the fuel had been used. 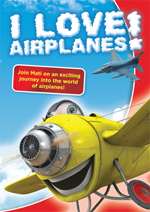 This had the effect of making the plane uncontrollable, resulting in an endurance of only 45 minutes in clean condition. The issue of the short endurance and low fuel capacity of the MiG-21F, PF, PFM, S/SM and M/MF variants-though each had a somewhat greater fuel capacity than its predecessor-led to the development of the MT and SMT variants. These had a range increase of 250 km (155 mi) compared to the MiG-21SM, but at the cost of worsening all other performance figures (such as a lower service ceiling and slower time to altitude). The delta wing, while excellent for a fast-climbing interceptor, meant any form of turning combat led to a rapid loss of speed. However, the light loading of the aircraft could mean that a climb rate of 235 m/s (46,250 ft/min) was possible with a combat-loaded MiG-21bis, not far short of the performance of the later F-16A. Given a skilled pilot and capable missiles, it could give a good account of itself against contemporary fighters. It was replaced by the newer variable-geometry MiG-23 and MiG-27 for ground support duties. However, not until the MiG-29 would the Soviet Union ultimately replace the MiG-21 as a maneuvering dogfighter to counter new American air superiority types. The MiG-21 was exported widely and continues to be used. 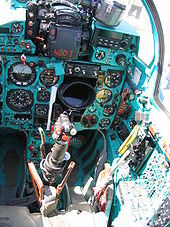 The aircraft's simple controls, engine, weapons, and avionics were typical of Soviet-era military designs. The use of a tail with the delta wing aids stability and control at the extremes of the flight envelope, enhancing safety for lower-skilled pilots; this in turn enhanced its marketability in exports to developing countries with limited training programs and restricted pilot pools. While technologically inferior to the more advanced fighters it often faced, low production and maintenance costs made it a favorite of nations buying Eastern Bloc military hardware. Several Russian, Israeli and Romanian firms have begun to offer upgrade packages to MiG-21 operators, designed to bring the aircraft up to a modern standard, with greatly upgraded avionics and armaments. Due to the lack of available information, early details of the MiG-21 were often confused with those of the similar Sukhoi fighters also under development. Jane's All the World's Aircraft 1960-1961 describes the "Fishbed" as a Sukhoi design, and uses an illustration of the Su-9 'Fishpot'. The MiG-21 is a single-engined jet fighter aircraft capable of supersonic flight. The MiG-21 has a delta wing. The sweep angle on the leading edge is 57� with a TsAGI S-12 airfoil. The angle of incidence is 0� while the dihedral angle is −2�. On the trailing edge there are ailerons with an area of 1.18 m�, and flaps with an area of 1.87 m�. In front of the ailerons there are small wing fences. A semi-monocoque with an elliptical profile with a maximum width of 1.24 m. The air flow to the engine is regulated by a cone in the air intake. Up until the MiG-21PF it is three staged. On speeds up to M=1.5 it is fully retracted, between speeds of M=1.5 and M=1.9 it is in the middle position, and with speeds higher than M=1.9 it is in the maximum forward position. However, on the MiG-21PF it adapts to the actual speed, according to the UVD-2M system aboard the aircraft, which monitors the pressure in front and behind the compressor of the engine. On both side of the nose there are gills to supply the engine with more air while on the ground and during takeoff. 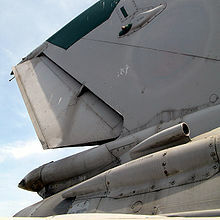 In the first variant of the MiG-21, the pitot tube is on the bottom of the nose; after the MiG-21P, every version of the −21 has this tube situated on the top of the air intake. The cabin is pressurized and air conditioned. The canopy up until the MiG-21PFM opens on a hinge on the front of the canopy. When ejecting, the SK-1 ejection seat connects with the canopy making a capsule to enclose the pilot and protect him from the airflow, after which it would separate and the pilot would parachute down. However, the canopy took too long to separate and some pilots were killed after ejecting at low altitudes. On the MiG-21PFM the canopy opens on a hinge on the right side of the cockpit. On the belly of the plane there are three air brakes, two at the front and one at the back. The front brakes have an area of 0.76 m�, and a deflection angle of 35�. The back one has an area of 0.46 m� and a deflection angle of 40�. The usage of the back air brake is blocked if the plane carries an external fuel tank. Behind the air brakes are the bays for the main landing gear. Under the body, just behind the trailing edge of the wing, two JATO rockets can be attached. The front part of the fuselage ends with former #28. Beginning with former #28a is the back part of the fuselage, which is removable for engine maintenance. The empennage of the MiG-21 consists of a vertical stabilizer, a stabilator and a small fin on the bottom of the tail to improve yaw control. The vertical stabilizer has a sweep angle of 60� and an area of 5.32 m� (on earlier version 3.8 m�) and a rudder. The stabilator has a sweep angle of 57�, an area of 3.94 m� and a span of 2.6 m.
A tricycle type undercarriage with a nose gear. The main landing gear has tires 800 mm in diameter and 600 mm in width (till the MiG-21P; 660x200 mm). The wheels of the main landing gear retract in the fuselage after rotating 87�, the shock absorbers retract in the wing. The nose gear retracts forward in the fuselage under the radar. The wheel base is 4.71 m, the track width is 2.69 m.
The MiG-21 engine was produced in several variants. * = limited (3-minute) "extra-power" reheat at altitudes 4000m (13,120 ft) or less. The following table shows the possible ordnance loads of various models of the MiG-21. In the pylons column, the number listed is per individual pylon. In 1961, the Indian Air Force (IAF) opted to purchase the MiG-21 over several other Western competitors because the Soviet Union offered India full transfer of technology and rights for local assembly. In 1964, the MiG-21 became the first supersonic fighter jet to enter service with the IAF. Due to limited induction numbers and lack of pilot training, the IAF MiG-21 played a limited role in the Indo-Pakistani War of 1965. However, the IAF gained valuable experience while operating the MiG-21 for defensive sorties during the war. The positive feedback from IAF pilots during the 1965 war prompted India to place more orders for the fighter jet and also invest heavily in building the MiG-21's maintenance infrastructure and pilot training programs. By 1969, India had acquired more than 120 MiG-21s from the Soviet Union. 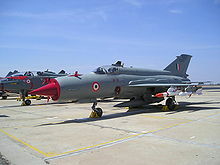 The safety record of the IAF's MiG-21s has raised concern in the Indian Parliament and media, leading to the aircraft sometimes being referred to in the IAF as a "flying coffin". One source estimates that in the nine years from 1993 to 2002, the IAF lost over 100 pilots in 283 accidents. During its service life, the IAF has lost at least 116 aircraft to crashes (not including those lost in combat), with 81 of those occurring since 1990. The expansion of IAF MiG-21 fleet marked a growing India-Soviet Union military partnership which enabled India to field a formidable air force to counter Chinese and Pakistani threats. The capabilities of the MiG-21 and the skills of its Indian pilots were soon put to the test during the Indo-Pakistani War of 1971. During the war, the MiG-21s played a crucial role in giving the IAF complete air superiority over vital points and areas in the western theater of the conflict. The 1971 war witnessed the first supersonic air combat in the subcontinent when an Indian MiG-21FLs shot down a PAF F-104 Starfighter with its GSh-23 twin-barrelled 23 mm cannon. By the time the hostilities came to an end, the IAF MiG-21s had shot down four PAF F-104s, two PAF F.6, one PAF F-86 and one PAF C-130 Hercules. According to Western military analysts, the MiG-21s had clearly "won" the much anticipated air combat between the MiG-21 and the F-104 Starfighter. Because of the formidable performance of the MiG-21s, several nations, including Iraq, approached India for MiG-21 pilot training. By the early 1970s, more than 120 Iraqi pilots were being trained by the Indian Air Force. It was also used as late as 1999 in the Kargil War, in which one Indian Air Force MiG-21 was shot down by a Pakistani hand-held "Stinger" surface-to-air missile. The MiG-21's last known kill took place in 1999 during the Atlantique Incident, when two MiG-21 aircraft of the Indian Air Force intercepted and shot down an Breguet Atlantique reconnaissance aircraft of the Pakistani Navy with the R-60MK (AA-8 Aphid) air-to-air missile. Picture - MiG-21F in Vietnam People's Air Force markings exhibited at the National Museum of the United States Air Force. The MiG-21, which initially achieved renown during the Vietnam War, in which it saw extensive action, was designed for very short ground-controlled interception (GCI) missions, which is precisely the type of missions that it was employed for in the skies over North Vietnam. The first MiG-21s arrived directly from the Soviet Union by ship in April 1966, and after being unloaded and assembled, were transitioned into North Vietnam's oldest fighter unit; the 921st Fighter Regiment, which had been established on 3 February 1964 as a MiG-17 unit. Since the North Vietnamese Air Force's 923rd FR was newer and less experienced, they would continue to operate strictly MiG-17s; while the arrival of the MiG-19's (J6 versions) from Communist China in 1969 would create North Vietnam's only MiG-19 unit, the 925th FR. On 3 February 1972 North Vietnam commissioned their fourth and last Fighter Regiment of the war while engaged with the United States, the MiG-21PFM (Type 94) equipped 927th Fighter Regiment. The MiG-21 was one of the most advanced fighter aircraft of the time; and although 13 of North Vietnam's flying aces attained that status while flying the MiG-21, and only 3 airmen became aces while flying the MiG-17, it is thought by many that North Vietnamese aces preferred flying the MiG-17, since the high wing loading on the MiG-21 made it less maneuverable than the MiG-17, and the less heavily framed canopy of the MiG-17 allowed pilots to more easily detect US launched air to air missiles. However, this is not the impression perceived by British author Roger Boniface when he interviewed Pham Ngoc Lan and ace Nguyễn Nhật Chix�u (who scored victories flying both MiG-17 and MiG-21) - Pham Ngoc Lan told Boniface that "The MiG-21 was much faster, and it had two ATOLL missiles which were very accurate and reliable when fired between 1,000 and 1,200 yards. ", and Nguyễn Nhật Chix�u asserted that "...for me personally I prefered the MiG-21 because it was superior in all specifications in climb, speed and armament. The ATOLL missile was very accurate and I scored four kills with the ATOLL. [...] In general combat conditions I was always confident of a kill over a F-4 Phantom when flying a MiG-21." Although the MiG-21 lacked the long-range radar, missiles, and heavy bombing payload of its contemporary multi-mission U.S. fighters, it proved a challenging adversary in the hands of experienced pilots especially when used in high speed hit and run attacks under GCI control. MiG-21 intercepts of F-105 strike groups were effective in downing US aircraft or forcing them to jettison their bomb loads. After a million sorties and nearly a thousand lost US aircraft, Operation Rolling Thunder came to an end on 1 November 1968. Poor air-to-air combat loss-exchange ratios against the smaller, more agile enemy MiGs during the early part of the Vietnam War eventually led the USN to create their Navy Fighter Weapons School, also known as "Top Gun" at Miramar Naval Air Station on 3 March 1969. The USAF quickly followed with their own version, titled the Dissimilar Air Combat Training (sometimes referred to as Red Flag) program. These two programs employed the subsonic A-4 Skyhawk and the supersonic F-5 Tiger II, as well as the Mach 2.4-capable USAF F-106 Delta Dart, which mimicked the MiG-21. Over the course of the air war, between 3 April 1965 and 8 January 1973, each side would ultimately claim favorable kill ratios. Two MiG-21s were claimed shot down by U.S. Air Force B-52 Stratofortress tail gunners; the only confirmed air-to-air kills made by the B-52. The first aerial victory occurred on 18 December 1972, kill awarded to tail gunner SSgt Samuel Turner, who was awarded the Silver Star for his feat. The second air to air kill took place on December 24, 1972, kill awarded to A1C Albert E. Moore for downing a MiG-21 over the Thai Nguyen railroad yards. Both actions occurred during Operation Linebacker II (also known as the Christmas Bombings). The biggest threat to North Vietnam during the war, had always been the Strategic Air Command's B-52 Stratofortress. Hanoi's MiG-17 and MiG-19 interceptors could not deal with those bombers at the altitude that they flew. In the summer of 1972, the NVAF was directed to train twelve MiG-21 pilots for the specific mission of attacking and shooting down B-52 bombers; with two thirds of those pilots specifically trained in the night attack. On 26 December 1972, just two days after Tail gunner Albert Moore downed his MiG-21, a VPAF (North Vietnamese Air Force) MiG-21MF (number 5121) from the 921st Fighter Regiment, flown by Major Phạm Tux�n over Hanoi, North Vietnam was responsible for the first claimed aerial combat kill of a USAF B-52 Stratofortress in aviation history. The Stratofortress had been above Hanoi at over 30,000 feet (9,100 m) during Operation Linebacker II, when MAJ Tuan launched two Atoll missiles from 2 kilometres, and claimed to have destroyed one of the bombers flying in the three plane formation. What appears to have in fact happened, was that he attacked the last three-bomber cell of a group of four. While his missiles missed their marked, as he was disengaging, a B-52 from Cobalt cell in front of his target took a hit from a SAM, and exploded in mid-air: this may have caused Tuan to think his missiles destroyed one of the B-52s. The Vietnamese side also claims another kill to have taken place on 28 December 1972 by a MiG-21 from the 921st FR, this time flown by Vu Xuan Thieu. Thieu is said to have closed in on one bomber too close, having fired a missile, and perished in the explosion of the B-52 resulting from his missiles hitting it. In this case the Vietnamese version appears to be a complete fabrication: while one MiG-21 kill was claimed by Phantoms that night (this may have been Thieu's MiG), no B-52s were lost to any cause on the date of the claimed kill. The MiG-21's 3G limit on maneuverability at altitude and the limited arc from which its weapons could be launched contributed to the poor results. 1966: US claimed 6 MiG-21s destroyed; North Vietnam claimed 7 F-4 Phantom IIs and 11 F-105 Thunderchiefs killed by MiG-21s. 1967: US claimed 21 MiG-21s destroyed; North Vietnam claimed 17 F-105 Thunderchiefs, 11 F-4 Phantom IIs, 2 RF-101 Voodoos, one A-4 Skyhawk, one F-8 Crusader, one EB-66 Destroyer and three unidentified types killed by MiG-21s. 1968: US claimed 9 MiG-21s destroyed; North Vietnam claimed 17 US aircraft killed by MiG-21s. 1969: US destroyed 3 MiG-21s; one Firebee UAV killed by a MiG-21. 1970: US destroyed 2 MiG-21s; North Vietnam claimed one F-4 Phantom and one CH-53 Sea Stallion helicopter killed by MiG-21s. 1972: US claimed 51 MiG-21s destroyed; North Vietnam claimed 53 US aircraft killed by MiG-21s, including two B-52 Stratofortress's. Soviet General Fesenko, the main Soviet adviser to the North Vietnamese Air Force in 1972, recorded 34 MiG-21s, 9 MiG-17's, and 9 MiG-19's destroyed in 1972. The MiG-21 was also used extensively in the Middle East conflicts of the 1960s, 1970s and 1980s by the air forces of Egypt, Syria and Iraq. The MiG-21 first encountered Israeli Mirage IIICs on 14 November 1964, but it was not until 14 July 1966 that the first MiG-21 was shot down. Another six Syrian MiG-21s were shot down by Israeli Mirages on 7 April 1967. The MiG-21 would also face F-4 Phantom IIs and A-4 Skyhawks, but was later outclassed by the more modern F-15 Eagle and F-16 Fighting Falcon, which were acquired by Israel beginning in the mid-1970s. During the opening attacks of the 1967 Six Day War, the Israeli Air Force struck Arab air forces in four attack waves. In the first wave, IDF aircraft claimed to have destroyed eight Egyptian aircraft in air-to-air combat, of which seven were MiG-21s; Egypt claims ten Israeli aircraft destroyed, four or five of which were scored by MiG-21PFs. During the second wave the Israelis claimed four MiG-21s downed in air-to-air combat, and the third wave resulted in two Syrian and one Iraqi MiG-21s claimed destroyed in the air. The fourth wave destroyed some more Syrian MiG-21s on the ground. Overall, the Egyptians lost around 100 out of about 110 MiG-21s they had, almost all on the ground; the Syrians lost 35 of 60 MiG-21F-13s and MiG-21PFs in the air and on the ground. 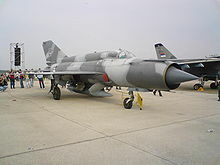 Between the end of the Six Day War and the start of the War of Attrition, IDF Mirage fighters had six confirmed kills of Egyptian MiG-21s, in exchange for Egyptian MiG-21s scoring two confirmed and three probable kills against Israeli aircraft. During the War of Attrition itself, the Israelis claimed 56 confirmed kills against Egyptian MiG-21s, while Egyptian MiG-21s claimed fourteen confirmed and twelve probable kills against IDF aircraft. During this same time period, from the end of the Six Day War to the end of the War of Attrition, the Israelis claimed a total of 25 Syrian MiG-21s destroyed; the Syrians claimed three confirmed and four probable kills of Israel aircraft. High losses to IDF aircraft and continuous bombing during the War of Attrition caused the Egyptians to ask the Soviet Union for help. In June 1970, Soviet pilots and SAM crews arrived with their equipment. On 22 June 1970, a Soviet pilot flying a MiG-21MF shot down an Israeli A-4E. After some more successful intercepts by Soviet pilots and another Israeli A-4 being shot down on July 25, the Israelis decided to plan an ambush in response. On July 30 Israeli F-4s lured Soviet MiG-21s into an area where they were ambushed by Mirages. Asher Snir, flying a Mirage IIICJ, destroyed a Soviet MiG-21; Avihu Ben-Nun and Aviam Sela, both piloting F-4Es, each got a kill, and an unidentified pilot in another Mirage scored the fourth kill against the Soviet-flown MiG-21s. Three Soviet pilots were killed and the Soviets were alarmed by the losses. However, Soviet MiG-21 pilots and SAM crews destroyed a total of 21 Israeli aircraft, which helped to convince the Israelis to sign a ceasefire agreement. In September 1973 a large air battle erupted between the Syrians and the Israelis; the Israelis claimed a total of twelve Syrian MiG-21s destroyed, while the Syrians claimed eight kills scored by MiG-21s and admitted five losses. For the whole war on the Egyptian front, the Israelis claimed a total of 73 kills of Egyptian MiG-21s, against 27 kills of Israeli aircraft claimed by Egyptian MiG-21s, plus eight probables. On the Syrian front of the war, 6 October 1973 saw a flight of Syrian MiG-21MFs shoot down an IDF A-4E and a Mirage IIICJ while losing three of their own to Israeli IAI Neshers. On 7 October, Syrian MiG-21MFs downed two Israeli F-4Es, three Mirage IIICJs and an A-4E while losing two of their MiGs to Neshers and one to an F-4E, plus two to friendly SAM fire. Iraqi MiG-21PFs also operated on this front, and on that same day destroyed two A-4Es while losing one MiG. On 8 October 1973 Syrian MiG-21PFMs downed three F-4Es, but six of their MiG-21s were lost. By the end of the war, Syrian MiG-21s claimed a total of 30 confirmed kills against Israeli aircraft; 29 MiG-21s were claimed as destroyed by the IDF. Between the end of the Yom Kippur War and the start of the 1982 Lebanon War, the Israelis had received modern F-15s and F-16s, which were far superior to the old Syrian MiG-21MFs. According to the IDF, these new planes accounted for the destruction of 24 Syrian MiG-21s over this time period, though the Syrians did claim five kills against IDF aircraft with their MiG-21s armed with outdated K-13 missiles. The 1982 Lebanon War started on 6 June 1982, and in the course of that war the IDF claimed to have destroyed about 45 Syrian MiG-21MFs. The Syrians claimed two confirmed and fifteen probable kills of Israeli aircraft. 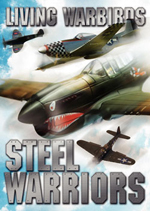 This air battle was the largest to occur since the Korean War. Egypt would be shipped some American Sidewinder missiles, and these were fitted to their MiG-21s and successfully used in combat against Libyan MiG-23s during the brief Libyan-Egyptian War of July 1977. MiG-21s were used by the Yemeni Air Force in ground attack role during Yemen's fight with Shi'a rebels in the north. On October 2, 2009 the rebels announced that they shot down a Yemen Air Force MiG-21 fighter jet in the al-Sha'af district in northern Yemen. A senior Yemeni military official has denied the claim and said the plane ran into a mountain peak because of a technical fault. Contradicting state media, another Yemeni military commander told the AFP news agency that the aircraft had been "flying at low attitude" when it was hit. Yugoslavia purchased its first batch of MiG-21s in 1962 from the Soviet Union. In the period from 1962 to the early 1980s Yugoslavia had purchased up to 216 MiG-21s in 9 variants. From 1964 to 1992, about 80 aircraft had been lost in accidents. 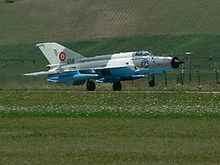 Yugoslav Air force units that operated MiG-21 were the 204th fighter-aviation regiment at Batajnica Air Base (126th, 127th and 128th fighter-aviation squadrons), 117th fighter-aviation regiment at Željava Air Base (124th and 125th fighter-aviation squadron and 352nd recon squadron), 83rd fighter-aviation regiment at Slatina Air Base (123rd and 130th fighter aviation squadron), 185th fighter-bomber-aviation squadron (129th fighter-aviation squadron) at Pula and 129th training center at Batajnica air base. 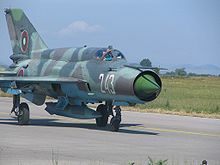 During the early stages of the 1991-1995 Yugoslav wars the Yugoslav People's Army used MiG-21s in a ground-attack role, while Croatian and Slovenian forces did not have air forces at the beginning of the war. Aircraft from air bases in Slovenia, Croatia and Bosnia and Herzegovina were relocated to air bases in Serbia. Detailed records show at least seven MiG-21s were shot down by AA defenses in Croatia and Bosnia. A MiG-21 piloted by Emir Ši�ić shot down a EU helicopter that had entered Croatian aerospace with full knowledge of the Yugoslav flight control (but neglected warnings). 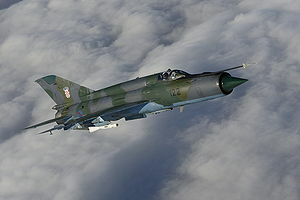 Croatia acquired three MiG-21s in 1992 through defections by Croatian pilots serving with the JNA, two of which were lost in subsequent actions - one to Serbian air defenses, the other in a friendly fire accident. In 1993, Croatia purchased about 40 MiG-21s in violation of arms embargo, but only about 20 of these entered service, while the rest were used for spare parts. Croatia used them alongside the sole remaining defector for ground attack missions in operations Flash (during which one was lost) and Storm. The only air to air action for Croatian MiGs was an attempt by two of them to intercept J-22 Oraos of Republika Srpska Air Force on ground attack mission on 7 August 1995. After some maneuvering both sides disengaged without firing. Remaining Yugoslav MiG-21s were flown to Serbia by 1992 and continued their service in the newly created Federal Republic of Yugoslavia. During the 1999 NATO attack on Yugoslavia, 33 MiG-21s were destroyed on the ground. During the Cold War MiG-21s were supplied to many sub-Saharan African nations by the Soviets. The Cubans also flew their MiG-21s in some of the conflicts. One of the more notable uses of MiG-21s in combat occurred during the Angolan Civil War in the hands of the People's Air and Air Defence Force of Angola. Cuban Air Force pilots also flew MiG-21s over Angola during the war. MiG-21s were used as fighter-bombers and most losses were due to ground fire. However, both Angolan and Cuban MiG-21s often had encounters with South African Air Force Mirages. On 6 November 1981 Major Johann Rankin, flying a Mirage F.1CZ, scored the SAAF's first kill since the Korean War, downing the MiG-21MF of Lt. Danacio Valdez. On 5 October 1982, a SAAF Mirage IIICZ damaged a MiG-21MF with cannon fire, but the MiG managed to return to base safely. During the Ogaden War of 1977-78, American-supplied Ethiopian F-5As flown by Israeli pilots met Somalian MiG-21MFs in combat several times. In one lopsided incident, two F-5As engaged four MiG-21MFs that were armed only with bombs. The Israeli pilots destroyed two and then watched with amazement as the two remaining MiG-21s collided with each other. The Israeli-flown Ethiopian F-5As claimed ten Somali MiG-21MFs; in return, Somali MiG-21MFs claimed four Ethiopian MiG-21MFs, one Canberra bomber and three DC-3s. Ironically, Ethiopia also received MiG-21s which were initially flown by Cuban pilots. The Cuban-flown MiG-21s were used to bomb Somali forces in the final Ethiopian counter-attack. MiG-21s, along with its Chinese copy (the F-7), flew ground sorties during the First and Second Congo Wars, sometimes being piloted by mercenaries. Ethiopia has had a number of armed conflicts with Eritrea following the latter's independence from the former. Both countries have received advanced fighters - the Ethiopians got Su-27 fighters from Russia, while the Eritreans received MiG-29s from Ukraine. On 26 February 1999, an Eritrean MiG-29UB destroyed two Ethiopian MiG-21s that were bombing Eritrean positions, but the MiG-29 was then attacked by an Ethiopian Su-27 and was lost. On 18 May 2000, another Eritrean MiG-29 downed one Ethiopian MiG-21 and damaged another, before getting shot down in turn by another Ethiopian Su-27. Beginning in 1993, Russia did not offer spare parts for the MiG-23 and MiG-29 for the Romanian Air Force. 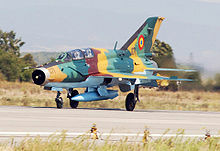 Initially, this was the context for the modernization of the Romanian MiG-21's with Elbit systems, and because it was easier for the Romanians to maintain these fighter jets. 110 MiG-21's were modernized under the LanceR designation. Today, only 48 LanceRs are operational for the RoAF. It can use both Western and Eastern armament such as the R-60M, R-73, Magic 2, or Python III missiles. They will be replaced in 2012 when new fighter jets will arrive, such as the F-16, F/A-18, Eurofighter Typhoon or Gripen. However due to lack of funds the MiG-21 LanceR may fly for years longer. Several pilots have attained ace status (five or more aerial victories/kills) while flying the MiG-21. Nguyễn Văn Cốc of the Vietnam People's Air Force (VPAF; also referred to as the NVAF), who scored nine kills in MiG-21s is regarded as the most successful. 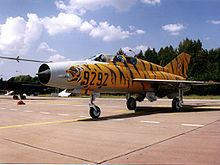 Twelve other VPAF pilots were credited with five or more aerial victories while flying the MiG-21: Phạm Thanh Ngx�n, Nguyễn Hồng Nhị and Mai Văn Cường (both eight kills); Đặng Ngọc Ngự (seven kills), Vũ Ngọc Đỉnh, Nguyễn Ngọc Độ, Nguyễn Nhật Chix�u, Lx� Thanh Đạo, Nguyễn Đăng Kỉnh, Nguyễn Đức Sox�t, and Nguyễn Tiến Sx�m (six kills each), and Nguyễn Văn Nghĩa (five kills). Col. Vadim Petrovich Shchbakov according to the 18th Report of the US government's "Task Force Russia", achieved ace status with six kills in the Vietnam War while serving as a pilot instructor. Additionally, three Syrian pilots are known to have attained ace status while flying the MiG-21. Syrian airmen: M. Mansour recorded five solo kills (with one additional probable), B. Hamshu scored five solo kills, and A. el-Gar tallied four solo and one shared kill, all three during the 1973-1974 engagements against Israel. Due to the incomplete nature of available records, there are several pilots who have un-confirmed aerial victories (probable kills), which when confirmed would award them "Ace" Status: S. A. Razak of the Iraqi Air Force with four known kills scored during the Iran-Iraq War (until 1991; sometimes referred to as the Persian Gulf War), A. Wafai of the Egyptian Air Force with four known kills against Israel. For specific information on kills scored by and against MiG-21s sorted by country see the Mikoyan-Gurevich MiG-21 operators page. Picture - MiG-21PFM of Polish Air Force 10th Fighter Reg. Picture - MiG-21MF of Polish Air Force 3rd Tactical Sqn. Generation Zero (1954-1956) The original developmental prototypes and concepts, to the first (pre)production aircraft. (Major variants: Ye-1, Ye-2, Ye-2A/MiG-23, Ye-4, Ye-50, Ye-50A/MiG-23U, Ye-5, MiG-21). Generation One (1957-1961) Initial mass-produced versions and further refinements and experiments. (Major variants: Ye-6, Ye-50P, MiG-21F, Ye-6T, MiG-21P-13, MiG-21F-13, Ye-6V). Generation Two (1961-1966) Further developments led to more advanced versions as dedicated interceptors which underwent near-constant refinements; a dedicated reconnaissance version (with interceptor capability) and a nuclear-strike variant were also developed. (Major variants: MiG-21PF/FL, Ye-7SPS, MiG-21PFS, Ye-7M, MiG-21PFM, Ye-7R, MiG-21R, Ye-7S, MiG-21S, MiG-21N, MiG-21PD). Generation Three (1968-1972) Development of the MiG-21 kept constantly moving with the times, from the MiG-21M to the ultimate variant, the MiG-21bis produced into the 1980s. (Major variants: MiG-21M, MiG-21I, MiG-21K, MiG-21Sh, MiG-21SM, MiG-21MF, MiG-21DF, MiG-21SMF, MiG-21MT, MiG-21SMT, MiG-21ST, MiG-21bis). Trainer Variants (1960-1968+) Trainer variants of the MiG-21 started being developed in 1960, and continued until the final design in 1968, which was manufactured for many years afterwards. 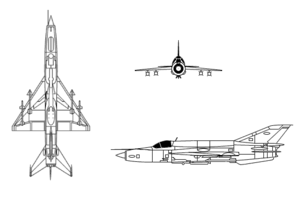 (Major variants: Ye-6U, MiG-21U, MiG-21US, MiG-21UM). Notes to table: * ADF = Automatic direction finder; an asterisk by the name means there is no DME module present. ** = An asterisk by the name indicates a rangefinding-only unit. MiG-21-93 Russia now offers an upgrade package to bring late-model MiG-21s up to the MiG-21-93 standard. This package provides an upgrade of the avionics suite that includes installation of the Kopyo pulse-doppler radar, smaller version of N010 Zhuk airborne radar used by the MiG-29, which enables the aircraft to fire a greater range of modern weapons such as the beyond-visual-range Vympel R-77 air-to-air missile. The upgraded avionics also enhance the aircraft's survivability as well as its ability to engage enemy fighters. Other upgrade features include installation of a dual-screen HUD, helmet-mounted target designator, and advanced flight control systems. Upgraded version for the Romanian Air Force done by Elbit of Israel and Aerostar SA of Romania. The LanceR-A version is optimized for ground attack being able to deliver precision guided munitions of eastern and western origin as well as R-60, R-73 and Python III air to air missiles. The LanceR-B version is the trainer version and the LanceR-C version is the air superiority version featuring 2 LCD MFDs, helmet mounted sight and the Elta EL/M-2032 Air combat radar. MiG-21 Bison Upgraded version for export, the Indian Air Force being the first customer. Equipped with the Phazotron Kopyo (Spear) airborne radar, which is capable of simultaneously tracking 8 targets and engaging 2 of them with semi-active radar homing air-to-air missiles, such as the Vympel R-27. The radar also enable the fighter to deploy active radar homing air-to-air missiles such as the Vympel R-77 when an additional channel is incorporated. Russia has claimed that this version is equivalent to the early F-16. It performed well against F-15s and F-16s of the USAF during Indo-US joint air exercises. MiG-21-97 MiG-21-93 upgrade. MiG-21-93 re-engined with the Klimov RD-33 engine. The Russians have claimed that the evaluation at Ramenskoye Airport had shown that this version has beaten simulated F-16 in a mock dogfight with a score of 4:1. Chinese-built variants of the MiG-21 are designated Chengdu J-7 and F-7 (for export). Only the initial version of the J-7 was a copy of a MiG-21 variant, namely the MiG-21F-13. Though an agreement had been reached between China and the USSR for licence production of the MiG-21 in China, political relations soured between the two countries, causing Soviet assistance to stop. This forced the Chinese to reverse-engineer parts of the handful of MiG-21F-13s supplied from the USSR, in order to make up for blueprints and documentation that had not yet been shipped over from the USSR at the time of the political rift. All subsequent development of the J-7 was indigenous to China and different from Soviet-made versions. Between 1962 and 1972 the MiG-21F-13 version was manufactured under license by Aero Vodochody, in Czechoslovakia. Aero Vodochody (then Středočesk� strojx�rny, n.p. ), built a total of 194 planes during this period, under the cover designation article Z-159. It followed the MiG-15 and MiG-19S built in Vodochody factory from the fifties to sixties. The sole locally-built version of the MiG-21F-13 differed externally from the Soviet-built examples by the solid dural sheet fairing behind the cockpit canopy, as opposed to the transparent one on the original Soviet MiGs. These machines were built for the Czechoslovak Air Force and also for export. The R13-300 engines were imported from the Soviet Union. The production of the MiG-21s in India under license by Hindustan Aeronautics in Nasik started with the MiG-21FL in 1966 in four phases starting with the assembly of CKD kits, moving on to subassemblies, parts, and finally advancing to production from scratch. 205 MiG-21FLs, designated Type 77 and nicknamed Trishul ("Trident), were built in India between 1966 and 1972; the first one built entirely from Indian-made components was delivered to the IAF on 19 October 1970, with the first Indian-made R11F2S-300 powerplant leaving the assembly line on 2 January 1969. In 1971 HAL production was switched to an improved version of the MiG-21M (izdeliye 96), which was designated Type 88 by HAL; as this variant was produced exclusively in India, no izdeliye designation is applicable. The first Type 88 MiG-21M was delivered to the IAF on 14 February 1973 and the last on 12 November 1981, with a total of 158 built. The last variant to be produced by HAL was the MiG-21bis. 75 were built in 1977 from CKD kits, and a further 220 were built from scratch by 1984. Despite a series of crashes during the 1990s, the Indian Air Force has decided to upgrade about 125 of the MiG-21bis in its inventory to the MiG-21 "Bison" standard. These will serve the Indian Air Force until 2018. This list does not include operators of Chinese copies / licensed manufactured versions known as the Chengdu J-7. Picture - Two seater MiG-21UM, Polish Air Force, markings of 3rd Tactical Sqn. 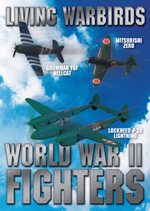 Some aircraft are now owned and flown by private collectors as warbirds. There are companies that purchase MiG-21s, MiG-15s and MiG-17s from Russia and other countries for sale onto civilians for around $US450,000. Picture - A Bulgarian MiG-21 taxis at Graf Ignatievo Air Base, Bulgaria during a bilateral exercise between the U.S. and Bulgarian air forces. Anderton, David A. North American F-100 Super Sabre. 1987, Osprey Publishing Limited. ISBN 0-85045-622-2. Gordon, Yefim. Mikoyan-Gurevich MiG-15: The Soviet Union's Long-Lived Korean War Fighter. Hinckley: Midland, 2001. ISBN 1-85780-105-9. Gordon, Yefim. Mikoyan MiG-21 (Famous Russian aircraft). Hinckley: Midland, 2007. ISBN 1857802578. Michel III, Marshall L. The 11 days of Christmas Encounter Books, 2002. 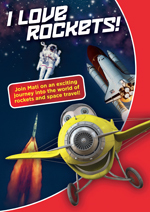 ISBN 1-893554-27-9. Toperczer, Istvx�n. MiG-21 Units of the Vietnam War (Osprey combat aircraft, 29). Oxford: Osprey Pub, 2001. ISBN 1841762636.